Caltrans demolished three piers of the San Francisco-Oakland Bay Bridge's old eastern span Saturday morning, officials said. Caltrans began demolishing the old eastern span in September 2013 after the new eastern span opened to traffic. The agency said it plans to finish demolishing the remaining marine foundations by mid-November. Pier E3, which was the largest pier and the closest to Yerba Buena and Treasure islands, was removed in 2015 and piers E4 and E5 were removed in 2016. The remaining piers will be removed every other weekend through the second week in November, Caltrans officials said. 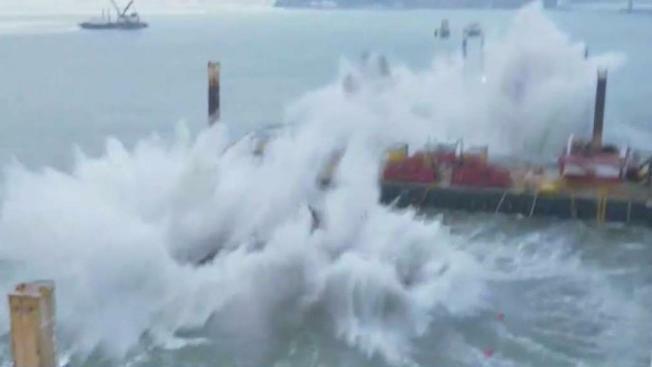 By combining the demolition of multiple piers, when possible, Caltrans says it is poised to save $10 million in taxpayer money.